US court rules that fine imposed on Chevron by Ecuadorean court in 2011 was “fraudulent” and secured with bribes, but defendants maintain Chevron’s Amazon pollution guilt and say they’ll appeal. The latest stage in the Ecuador-Chevron saga has seen a US court rule that prosecutors seeking financial compensation from Chevron will not be allowed to use US courts to enforce a 2011 Ecuadorean ruling that imposed a US$19bn fine on the company, as this ruling was fraudulent. Lawyers representing communities in Lago Agrio and other affected areas supposedly resorted to bribery to bring about the 2011 ruling, which demanded that Chevron pay for the environmental and social damages committed by Texaco (since acquired by Chevron) in the Ecuadorean Amazon between the 1960s and 1990s. This verdict was upheld by a top Ecuadorean court last year, although it halved the damages sought to US$9.5bn. Prosecutors have since struggled to enforce the fine, as Chevron no longer holds any assets in Ecuador, and so they have had to attempt to gather the compensation using courts in countries where Chevron does still have a presence, such as Brazil, Argentina, and Canada. However, after New York district judge Lewis Kaplan’s ruling that the Ecuadorean ruling was reached via “corrupt means”, it appears that prosecutors will not be able to press charges against the US-based oil giant in its own country. Chevron had claimed that the legal team in Ecuador, led by US lawyer Steven Donziger, had used bribes to convince an Ecuadorean judge to rule against the oil giant in 2011. 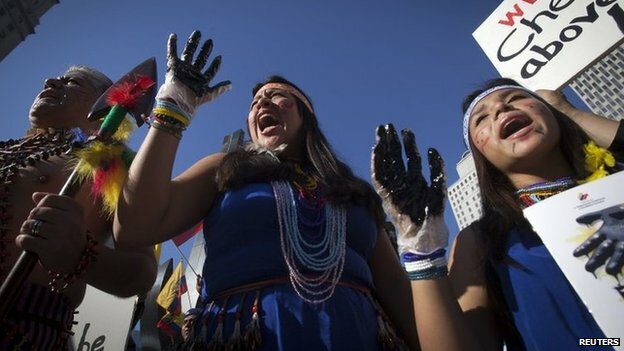 Members of the Ecuadorean diaspora in New York City protest against Chevron. “Justice is not served by inflicting injustice”, Kaplan wrote in his 500-page ruling. “The ends do not justify the means. There is no ‘Robin Hood’ defence to illegal and wrongful conduct”. Chevron’s CEO, John Watson, classified the ruling as “a resounding victory for Chevron and its shareholders”, while Donziger remarked that Kaplan was “wrong on the law and wrong on the facts”, adding that he will appeal the “appalling decision resulting from a deeply flawed proceeding”. Donziger has maintained since the early days of the trial that Kaplan holds a personal grudge against him, and that the case has been unduly influenced by Chevron money in attempts to discredit him and the villagers seeking compensation. In a statement made after the latest ruling, Donziger asserted: “Well before the trial began, Judge Kaplan made it clear he would rule against us. By not allowing me and my clients to argue before a jury, we did not have a chance to tell the real story of Chevron’s wrongdoing in Ecuador which proves the [2011 Ecuadorean] judgment is based on overwhelming and unassailable scientific evidence that Chevron committed an environmental disaster that continues to cause harm to thousands of people”. However, he continued: “It is worth noting that this ruling is a far cry from what Chevron wanted. It does not block enforcement of the Ecuador judgment. Nothing in Judge Kaplan’s ruling will prevent my clients from pursuing the judgment’s enforcement in other countries. The villagers deserve justice, and I am confident they will get it despite Chevron’s efforts to undermine the rule of law. I will continue my efforts on behalf of my clients consistent with the law. I also will pursue an immediate and expedited appeal so that a panel of impartial judges can review this decision”. Actress Mia Farrow (R), with Ecuadorean President Rafael Correa (L), when Farrow took part in the “La Mano Sucia de Chevron” campaign earlier this year. As I emphasised in my original article on the Ecuador-Chevron case, where I explain the history of the case and the accusations against Chevron in more detail, it was always highly unlikely that the outcome of this battle would be decisive in the wider legal war between Ecuador and Chevron. Donziger’s remarks make it clear that his team were never holding out high hopes for this latest trial, given the history of hostilities shown by Kaplan and Chevron towards Donziger and the Amazonian inhabitants he is representing. They also make it clear that they will continue to press for justice until Chevron pays up for the damage it caused in the Ecuadorean Amazon, both by appealing Kaplan’s ruling in the US and by continuing to push for compensation in other countries where Chevron still operates. In the meantime, the Mano Sucia de Chevron (Dirty Hand of Chevron) campaign backed by the Ecuadorean government and President Rafael Correa will continue in its efforts to raise international awareness of the conflict and the case against Chevron. It has already earned itself a following of numerous high-profile celebrities, including figures from the acting world such as Brad Pitt, Mia Farrow, Sean Penn and Leonardo DiCaprio, and from the music world such as Bono and Sting. The hope for the Ecuadorean side is that the campaign will help put the case in the international spotlight, and that alongside the potential political support from other Latin American leaders that President Correa is attempting to drum up, this will all help to sway international opinion more in favour of Ecuador and against Chevron – raising the prospects of future attempts to pursue the oil giant in foreign courts having more success than they have just had in the US.